In general, the cavity filling process can be divided into three stages. These stages include numbing, decay removal, and filling. We will discuss them all below. The first thing that usually happens when you have a cavity filled is that your dentist will numb the area where the cavity is. Typically, this consists of two steps. First, your dentist will rub a numbing gel in the general area of your cavity. This numbing gel is used to make the administration of the anesthetic more comfortable. Once the gum area is numb, the anesthetic is gently administered with a syringe into your gums near the area that is receiving treatment. You shouldn’t feel any discomfort during this stage of the procedure. In fact, you shouldn’t feel anything. Once you are numb, your dentist will place a device in your mouth called an Isodry. It is designed to keep your mouth open during the procedure so that your dentist can work quickly. It also provides the suction needed to keep your teeth dry (as saliva can interfere with the procedure). Then, your dentist will remove any decayed areas of the tooth. This is done to so that the decay can’t spread disease to healthy areas. After your tooth has been cleaned out, your dentist will fill the area that has been removed with a permanent filling. These fillings can be made out of a number of materials, all of which offer different benefits. Every person and every tooth is different. Materials are chosen based on what is best in each particular circumstance. 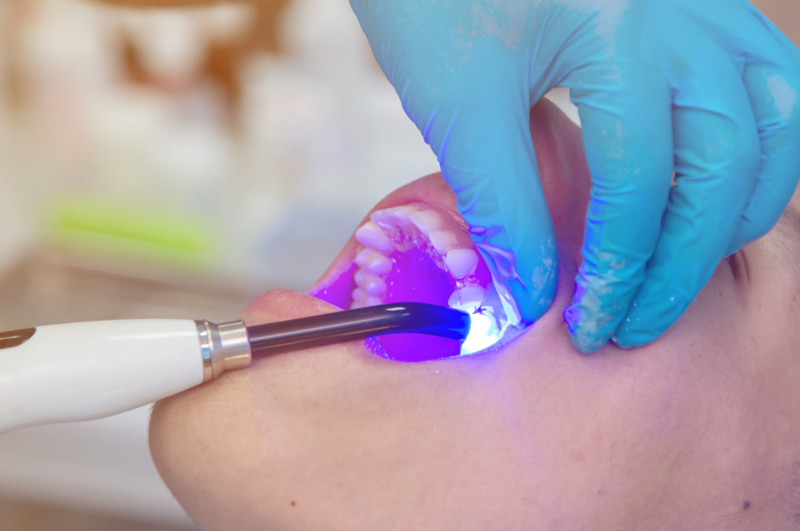 Often, a “curing light” is used to harden the filling material once it is placed. As noted above, there are many types of fillings that can be used to fill cavities. Three of the most common types of fillings we use at Dental Innovations include composite/resin, gold, and zirconia. Due to their tooth-colored appearance and excellent durability, composite fillings are one of the most popular options on the market today. Gold fillings offer excellent durability, but they can be more noticeable than composite fillings. Zirconia is more durable than composites and also present with a natural tooth color. After your cavity has been filled, your mouth will be numb, and will generally remain numb for at least a few more hours after the procedure. As a precaution, it is recommended that you refrain from eating and from drinking hot beverages until the numbness wears off. If you think you need a filling or feel any sensitivity, call Dental Innovations – your local dentist in Lincoln Square. We use state of the art dental products and technology that will help you feel at ease. We go out of our way to make our patients feel both welcome and comfortable in our practice. Our goal is to make your experience with us as pleasant as possible. Schedule an appointment by contacting our office today!